The issue of iMessage not syncing between Mac and iPhone is related both to user errors and minor software glitches that prevent iMessages from syncing on Mac. Let us take a look at how to fix this issue. Perhaps the most useful feature of iMessage is that it allows you to send and receive Messages both on your iPhone and Mac. For example, if you receive an iMessage on your iPhone, you will be able to find the same iMessage on your Mac. However, iMessage is known to be quirky at times and it is not uncommon to find Messages arriving on your iPhone but not appearing on Mac. You will find below some of the solutions that you can try to fix the issue of iMessages not syncing on your Mac. In order to allow syncing of iMessages between iPhone and iPad, you need to use the same Apple ID on both iPhone and Mac. There is no way for this feature to work, in case you are using different Apple ID’s on your iPhone and Mac. 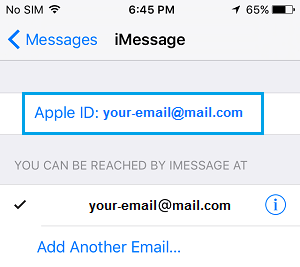 In case you have added other Email Addresses to iMessage in addition to your Apple ID Email, you need to make sure that these emails have been activated for iMessage, both on your iPhone and Mac. 1. On your iPhone, tap on Settings > Messages. 2. On the Messages screen, tap on Send & Receive. Also, take a look at Apple ID and make sure that it is the same Apple ID that you are using on your iPhone. 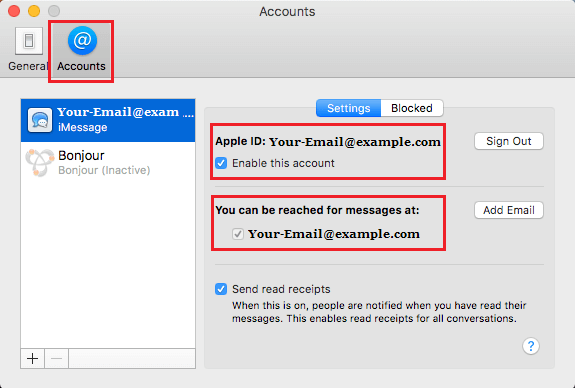 Now go to your Mac and follow the steps below, to confirm that you are using the same Apple ID and the same Email Address under “You Can be Reached by iMessage At” section. 2. Next, click on the Messages tab in the top-menu bar of your Mac and then click on Preferences in the drop-down menu. 3. On the next screen, click on the Accounts tab and make sure that the Email appearing under section “You can be reached for Messages At” has a check mark and it is the same Email Address that is also active for iMessages on your iPhone. 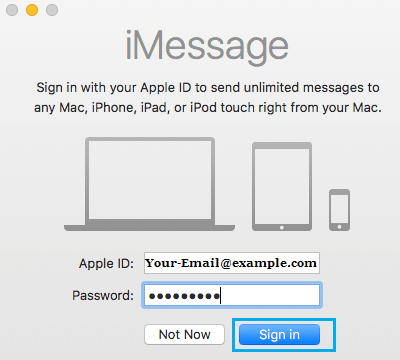 In general, you need to make sure that you are using the same Apple ID on both devices and the same Email Address under “You can be Reached For Messages At” section. Even though you have the same Email Address and Phone Number activated for iMessage on iPhone and Mac, you may still come across the case of iMessages getting to your iPhone without any problem but those Messages not syncing to your Mac. In such a case it is likely that iMessage is giving priority to your iPhone over your Mac, pushing Messages to iPhone first and delaying or not at all pushing those Messages to your Mac. A simple solution to this problem is to simply send an iMessage from your Mac. 2. Send an iMessage from your Mac to someone that you know. 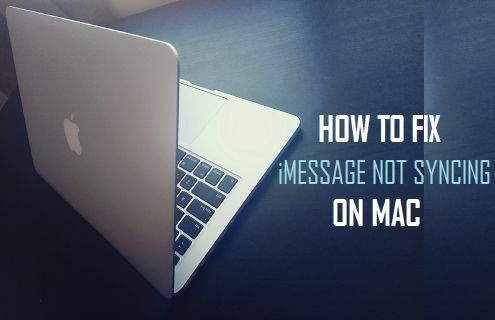 Once your Message is sent, you should soon see all the Messages appearing on your Mac, as if the Messaging App on your Mac was looking for a confirmation of you being active and present on your Mac. Since the problem is appearing on Mac, we will first sign out of iMessage on Mac and sign-in back again. This can help resolve any technical glitches that iMessage on your Mac might be going thorough. 2. 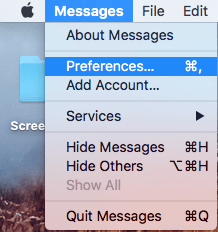 Next, click on the Messages tab in the top-menu bar of your Mac and then click on the Preferences option in the drop-down menu. 3. On the next screen, tap on the Accounts tab and sign-out of iMessage App by clicking on the Sign out button. 4. After a few seconds, open the Messaging App on your Mac by clicking on Messages icon in the dock. 5. 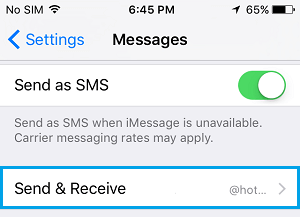 Whenever prompted, Sign-in to iMessage using your Apple ID Email Address and Password. In case signing out of iMessage and signing back-in on Mac did not help, you can try the same steps on your iPhone. 3. 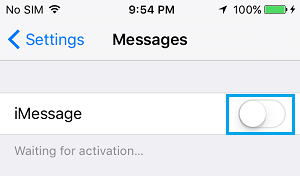 After a few seconds, turn iMessages back on your iPhone by moving the toggle next to iMessage to ON position. The way iMessage works, you will have iMessages appearing on your iPhone, even if you had deleted these iMessages on Mac. The same thing happens when you painfully go through the process of deleting iMessages on your iPhone, only to see them appearing on Mac. This happens because iMessage generates different security keys for your iPhone and Mac and makes use of these security keys to push Messages separately to your Mac and iPhone. 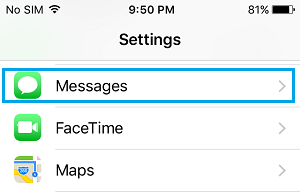 In short, iMessage syncing only makes iMessages appear on both devices, it does not work like traditional syncing.